Quinta da Cholda began the implementation of precision agriculture (AP) with the aim of increasing production and to reducing time of operations, costs and CO2 emissions and Nitrous Oxide. At the same time, we are trying to minimise human impact on the ecosystem. Due to the sharp drop in maize prices, AP was an absolute necessity to maintain the competitiveness and the sustainable of our farm. The first step of implementation of AP occurs at 2013 with the collection of yield data. In 2014, we introduced the automated guidance system on our tractors (in 2017 we implement this system in the harvester as well). Also in 2014, we began to use satellite, aircraft and drone images. We had work with many companies that allowed us to compare the pros and cons as well as the costs of these techniques. This data allowed us the opportunity to do some corrections throughout the campaign. In 2016 we began to mapping the apparent soil electrical conductivity (ECa). That was very important for the characterization of the soil variability. Today we know the ECa of the totality of our fields. We are now investing in the organization of all information in a single GIS platform (QGIS). Our goal is to have all data organized and friendly to use so that it can easily shape our decisions. All this investment on data collection introduce a new operative model that is now based on the real needs of which zone of the field. We have now the possibility to do differentiated application of fertilizers, herbicides and seed density (VRT) based on the variability of the fields. But to achieve all this, we had to overcome many difficulties: poor academic education of our collaborators, lack of support by the distributors of equipment, and the how to manage and organize all the data. Quinta da Cholda is very committed to helping all the research that the Sparkel project seeks to develop, to improve and accelerate the adoption of precision agriculture in our countries. 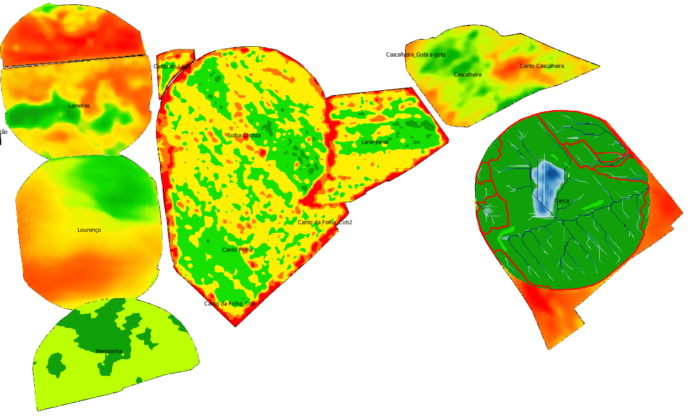 Examples of the geomaps with the different data from our fields (see pic).